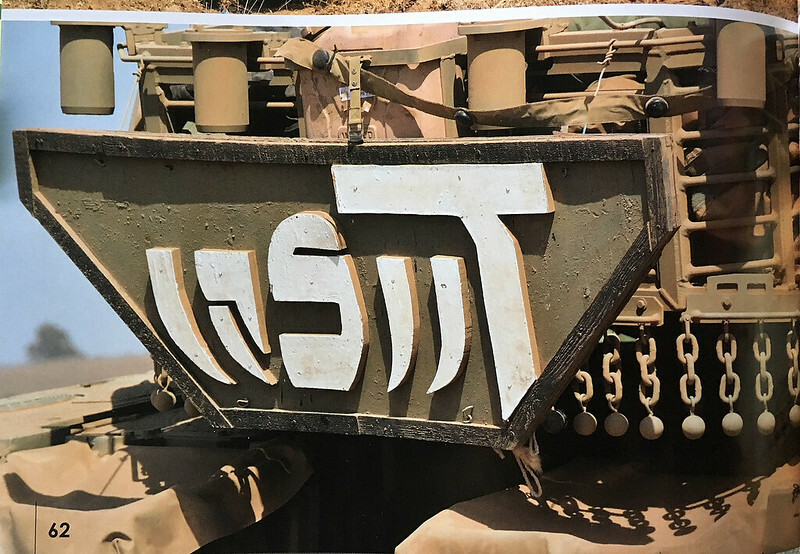 Below is a photo courtesy of and copyright Michael Mass and Adam O'Brien from their Merkava Siman 4 / 4M in IDF Service - Part 3, page 62. It's a fabulous book, and I'm planning to recreate this tank during my Meng Merkava 4M with Trophy build. My apologies to the authors as I bent the page a bit while copying; trust me that the book image is perfectly square! Below is the insignia I scratch built which I plan on placing on the back of the tank when it's complete. It took awhile, but I think it came out pretty decent. Be advised that this insignia is only 2 inches across at the top, the perfect size for a 1/35 scale tank. Of course, you can always see more details when you shoot photos of what you create... I can hardly wait to see what it looks like on the tank, but it will be awhile. I'm not the world's fastest builder. That looks really good. Can't wait to see it on your Merk. Thanks, Eric, nothing like fishing for compliments, eh? LOL In any event, as I wrote above, the thing I made actually does look better in person, because at greater than life size, you can see every defect, and it makes me want to do it over. but from 6 inches away, I think it looks okay. I'm planning to build my 4M as the training version with all the conduits and cables. It's really a messy looking tank with all of that hanging in place, but it's a challenge to build something like that...it will be a first for me. Thats a great plywood plate, Curt. and.. yes, I gave the permit to Curt to publish the photo from the book. This kind of modeling touch, brings our mutual hobby to the edge, with this unique feature. Looking forward to see your build with the rest of the 'Vulcan' insignia. As ‘Vulcan’ is my former outfit, I have to say you’ve done a terrific job! That is very kind of you to say. I only hope that the rest of the tank ends up being as good! I may have more questions for you as I continue my build, as I want this tank to be as perfect as I can make it! I greatly appreciate your very nice words! Thank you! your insignia placard looks great ! Good on you for going to the extra step asking for the authors permission to post a photo from their book. Thanks, Sean. Only fair to ask folks who worked hard to create a document for our benefit to concur with putting their pictures out in the ether! Thanks! And....I’m way ahead of you! I noted the crack, in particular on the third character from the left, and it bothered me. So, yes, I filled in the crack with a thick dollop of white paint (Tamiya XF-2 flat white) and once I’ve verified the crack is filled, I’ll give all the letters another appropriate coat for good measure. I’ll take another picture when I’m done. Thanks for the suggestion! And...if I’m SUPER motivated, I may try to do another one of these. The one part of this effort that I was particularly not thrilled with was the lack of the ‘unpainted’ edges around the black border and each letter, on the real thing. If I try it again, I’ll pay attention to that aspect and try to leave those edges unpainted, or at least painted in a tannish tone to look like unpainted wood, which you can see very clearly if you look at those edges in the top photo on the real tank. You don’t notice that if you look at the board straight on, but in the bright sun and at an oblique angle, as in the top photo, it’s really obvious. Note also that the edges of the letters of the 1:1 appear to be unpainted. Thanks for the video, Israel! It’s really interesting to see these tanks ‘come alive’, see them move and make noise! I agree that the insignia is different from the one I made, though definitely similar. I’m surprised at how stark the white letters appear to be in the video...I would honestly, despite the photos and now, video, think that dust and dirt thrown up by the tracks would ‘dull down’ those letters significantly, but apparently not! Agree 100%, as I mentioned in one of my posts. I wish I had made a more significant attempt to keep the edges of the letters free from white paint. I guess I felt that I should either go fully painted or fully unpainted, and once I dribbled some on an edge or two, I just painted them all. Maybe I’ll try again if I get bored, though frankly, I’d be surprised if I could make a second one as good as I ‘lucked out’ with on the first one! I know that feeling. Sometimes it's just better to be lucky than good.